This past week I was in Orlando visiting family, including my new baby niece named Sofia! My daughter who is a big fan of Sofia the First kept going on and on about how great the show is and how her baby cousin will love it. So imagine her surprise when we get back and there is a Sofia the First: The Curse of Princess Ivy DVD and kit waiting for her at home! She was psyched to say the least!! Recently released on February 24th, 2015. 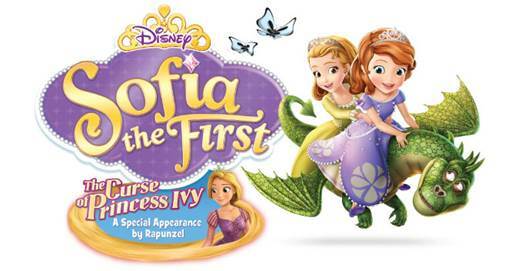 Sofia the First: The Curse of Princess Ivy is a DVD features a full-length episode of The Curse of Princess Ivy, but is also packed with 3 other enchanting tales, and a magical surprise inside - a free exclusive color-changing butterfly necklace! In this thrilling adventure, Amber snatches the Amulet of Avalor while Sofia is sleeping after learning that it is magical. Unfortunately, she unwittingly unleashes a curse that summons evil Princess Ivy, who threatens to destroy the amulet, seize the crown and turn the entire kingdom black-and-white! Amber and Sofia soar through the skies on a flying dragon – aided by special guest Rapunzel – as they embark on a daring quest to defeat Ivy, break the curse and save Enchancia. Packed with high-flying excitement, plus three more song-filled episodes, The Curse of Princess Ivy shows how love, trust, and unselfishly putting others’ needs first can truly work magic! Arianna and I really enjoyed this movie. In fact, here is what she had to say about it including the lesson she took away from it and the songs liked. I would give this to my daughter wo absolutely loves Sophia! If I won, this DVD would be for our family. I would gift this to my granddaughter if I were to win. I would put it in the treasure box in my 2nd grade classroom. I would give it to my granddaughter, she loves Sofia. i'd give this to my nieces! I would give this to my 6 year old niece. She LOVES Sophia!